This site serves as the central portal for agency stakeholders, the survey team and the general public to learn more about various electronic survey projects. An introduction and overview to the agency electronic survey team, projects, and processes. TriMet relies on on-board rider surveys to produce data in support of planning initiatives, Title VI and FTA reports. The findings and statistical analysis provide valuable information about riders, travel patterns, as well as the effects of new rail alignments, service and fare changes. 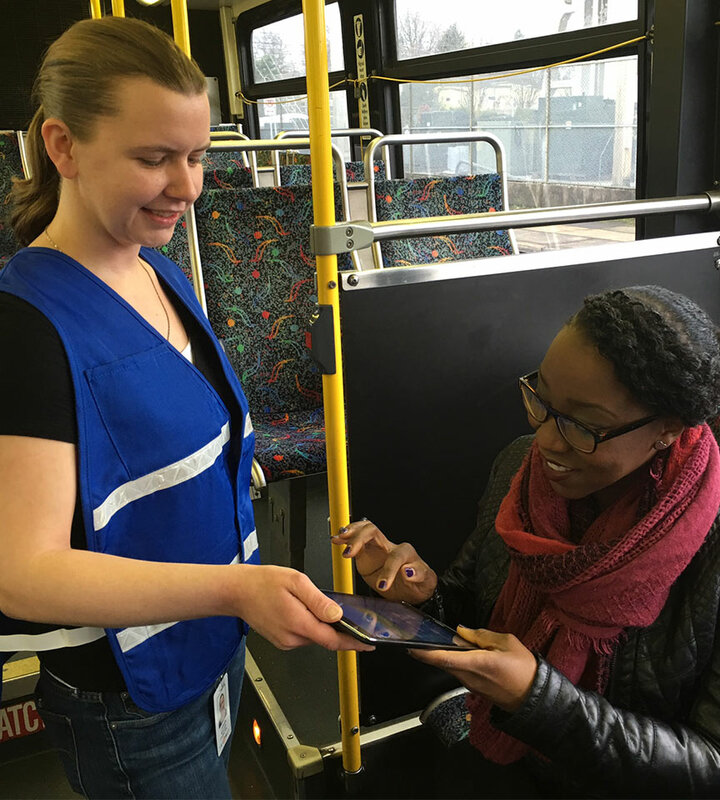 TriMet migrated all on-board rider surveys from paper to electronic tablet data collection during the 2014–2015 Orange Line Before Study. The survey budgets were consolidated and a position was created to manage and oversee the implementation of electronic surveys at an agency-wide level. The new approach includes the recruitment of local college students to conduct on-board surveys, and the utilization of robust and affordable open source software. This strategy results in significant time and cost savings, provides more accurate and reliable data, offers a more eco-friendly approach, and improves customer relations. All on-board surveys are now conducted with tablets and managed centrally in IT-GIS by the Electronic Survey Developer & Analyst. The TriMet Electronic Survey team is currently housed under the IT-GIS department, within the Public Affairs division. The team includes one project manager (Electronic Survey Developer & Analyst) and about 20 part-time surveyors. The survey team conducts regular on-board customer intercept surveys. These surveys range from fare surveys to customer satisfaction surveys. The data gathered from these surveys is used by multiple departments in the agency to study a variety of programs and proposals. In addition to conducting on-board surveys, the survey team also helps Customer Service, Comunity Affairs, Marketing Research, Facilities, and Service Planning carry out other assignments. The surveyors approach passengers on the bus, MAX and WES and ask them to participate in a brief survey. 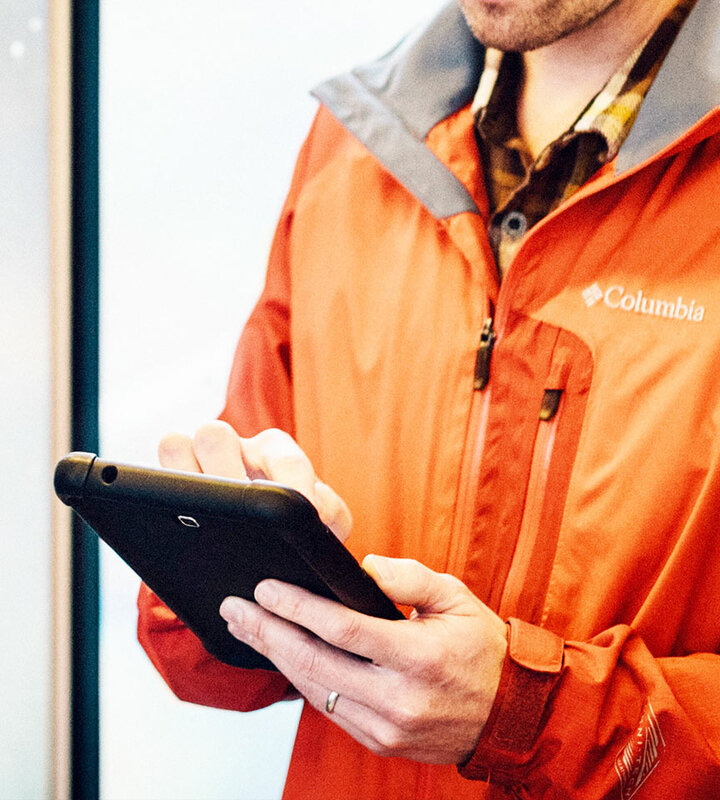 Generally, the data is entered into the tablets by both the surveyors and the passengers. Surveyors will typically be working individually on the bus lines or in groups of two on MAX and WES. Everyone will have extensive training in the following: safety and customer service, communication, survey administration, and tablet use. 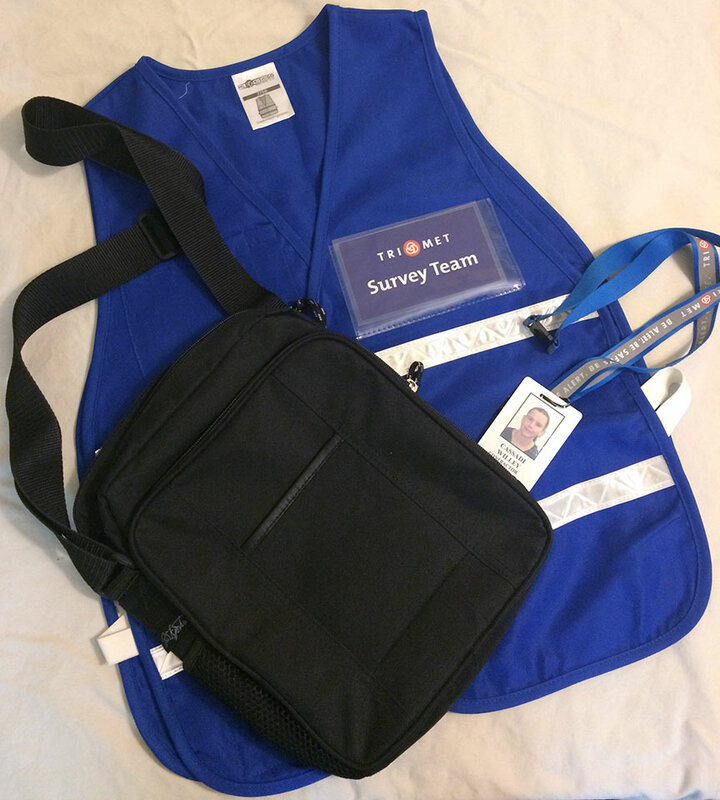 They will be wearing blue vests labeled “TriMet Survey Team” on front and back. They will have TriMet badges with photos and transit privileges. Each will carry a handheld tablet and shoulder bag. We rely almost exclusively on open source software to collect and manage data, and manage survey projects. On the data collection side, we use Open Data Kit (ODK). ODK was selected based on requirements, costs and the ability to easily customize for various surveys. It is a collection of open source tools for survey design, collection, and data aggregation and is recommended by industry experts. We use PostgreSQL and PostGIS databases to store survey data. We also develop in-house customized Android apps that work well with ODK to capture boarding/alighting, and origin/destination data. We use Python Flask to write API to send data from tablets to data servers. Python Flask is also our framework used to develop web dashboards to track project status, monitor data, and visualize results. Here is our GitHub source code page. This graph shows that the cost per sample hour for the 2016 spring fare survey is significantly lower than that of the 2012 survey. The 2016 survey and 2012 survey covered similar routes and had similar sample sizes.